We might know Jesus better, and pray the Hail Mary better, if we see how his portrait is painted in that prayer. There are at least six images of Jesus there. “Full of grace.” The first word we hear, before we even hear mention of Jesus himself, is grace. Grace that fills. Grace that brings happy greetings, and blessings: Ave! 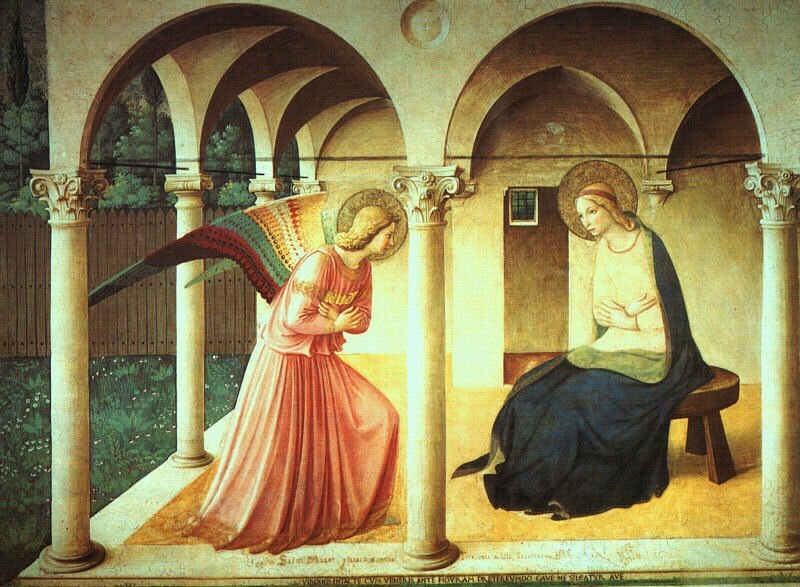 The Hail Mary – and the Angel Gabriel, who speaks these first words – makes a striking choice, putting Mary before Jesus. Hail Mary! Not yet Jesus. Full of grace! It is as if to say, the one who is coming is good news. The one we are about to speak of impacts you, for the better. Imagine turning it the other way: “The Lord is with you. Full of grace.” Lucky you. Perhaps, maybe, we would say, yes, all that “full of grace” means is that the Lord is with you. You’re lucky – for something outside of you. But it has no real impact on your inside. Instead, the Angel says to Mary, and the Hail Mary says to us, hey look, look at the joy that has burst into her heart. That joy begins with Jesus – it is grace. But it is a joy we can see in Mary already, before we even get to Jesus. He really transforms her! Fills her with his blessings. “The Lord is with you.” Now we get to the real portrait. LORD, of course, is Biblical language for the God of Israel; it’s the way Jews (and Mary and Gabriel are Old Testament people) avoid saying the unspeakable divine name, YHWH. Again, there’s rhetorical genius in putting this first. We’re about to see a baby. At the very least, we will see something present to human beings. But the first word is: beware! This is God! This is infinitely more than you can imagine! The one who is with you is . . . the LORD! And everything else, everything about how grace works, and the Christian life, and Christian spirituality, and what it means to be Mary: it is all about our relation to the great I AM before whom Moses removes his sandals. “The fruit of your womb.” But the very next image of Jesus is the opposite: after speaking of his divinity, the Hail Mary speaks of his humanity. 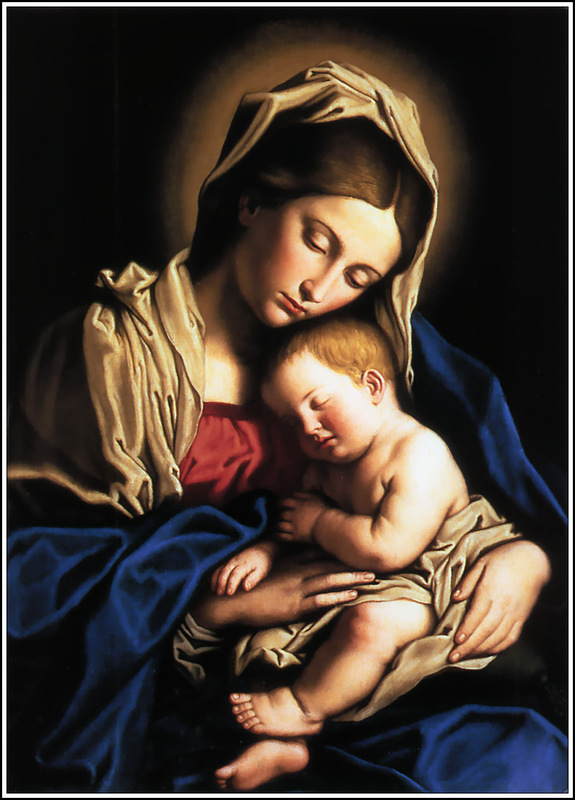 Her womb: what heaven cannot contain, has been contained in a small space – the small space of her belly, and the small space, too, of an infant. Fruit: as if to emphasize that this is not just something “in” her womb, it’s something that comes from her, something proportionate to her, really her child. After seeing him as God, we now see that he is profoundly human, as well. He is the great I AM who has become, truly, a poor woman’s child. “Jesus.” “You shall call his name Jesus: for he shall save his people from their sins” (Mt 1:21). Jesus means savior. And it is like a culmination of what has come before: anything less than God, the LORD, could not save us. But the way he chooses to save us is by becoming one of us. He blesses us (“blessed art thou among woman,” in your humanity) by himself sharing in our blessedness (“and blessed is the fruit of your womb”). He shines his grace into us – truly into us, truly permeating our humanity – by radiating that grace from his own humanity. He makes our hearts love by having himself a human heart that loves. Fills our suffering with divine love by himself making suffering divine. That is the salvation he brings – that is “Jesus”: man filled with God, the LORD becoming the fruit of Mary’s womb. “God.” Then the second half of the prayer asks Mary to pray to God for us. From this image of Jesus we look heavenward, and ask the Divine to bless, transform, divinize our sinful humanity. “God” is the only part of this prayer common to all religions. We all look heavenward and ask for blessings. But we who know Jesus – the Jesus of the first part of the Hail Mary – look to that God in a new way, beseech his blessings in a new way, beg, indeed, for new blessings, the blessings of Jesus, of God entering into the very heart of man. “Mother of God.” The final image of Jesus in the Hail Mary is relational. Mother of God is a statement first of all about Jesus, not Mary. It says, not that she is raised above God, but that he has subjected himself to his people. She cannot make herself mother – only God can make her to be mother. And yet he has. “Mother of God” stands for all the fantastic-ness of God daring to put himself in our hands, to come that close to us, to make it so that we can beg to him not just as the divine, but as the one who has become ours. As an old Marian hymn says, qui pro nobis natus, tulit esse tuus: who, born for us, suffered himself to be (truly) yours. The Hail Mary ends by juxtaposing our present with our end, our “now” with “the hour of our death.” It is helpful to begin our meditation on these words by thinking of the old ladies who are such famous devotees of the rosary – and thinking, particularly, of their annoying habit of whispering their prayers, as if they are actually saying the words of the rosary. Perhaps – is it possible? – those old ladies are wiser than we. Perhaps they have learned to pray the Hail Mary. And perhaps, for them, “the hour of our death” is not such an abstraction as it sometimes is for us who are younger. At some point in life, the hour of our death becomes an approaching reality, something we can no longer ignore. Today, younger people are often embarrassed by the Tradition’s insistence on thinking about this. Old prayer books, and old religious art, are full of reminders that we will die, prayers for a happy death, meditations on what it means to be truly prepared for our end. Nowadays we think that is morbid. But it is a real strength of Catholicism that our faith does not abandon us at the hour of our death. We even have a sacrament for it. (Although Vatican II reminded us that you can receive the Anointing of the Sick before you are actually at your dying breath, it remains a sacrament specifically focused on facing death.) And our most cherished prayer reminds us, dozens of times a day, that death is around the corner. But then, death is part of life. We all face the death of our grandparents, parents, and spouses, and all too many of us – including three of my closest friends, for example – even experience the death of our small children. It is no mercy, no embrace of life, to ignore the hour of our death. Now, death is not right. We rebel against it because we know we are made for eternity. That instinct is right. But the Bible tells us death is a punishment, a consequence of sin. Sin, separation from God, is the real tragedy. But punishment is never ultimate; punishment, by definition, is meant to correct us. It is a gift to get us on the right track. How does death get us on the right track? By reminding us that we are finite. Our projects will end. Our strength will end. Our influence will end. We are not the ultimate! That is part of the beauty of including the hour of our death in the Hail Mary. The Hail Mary is all about grace, about the work God does for us. We are blessed because He is with us. On the one hand, yes, truly blessed. On the other hand, blessed by him, only by him. We are in need. So we ask for prayers. We recognize that we are sinners: “pray for us sinners.” And we recognize that in the end, we face an ultimate that we really cannot surmount. We can play make believe with Pelagianism; we can pretend that life comes down to our own moral heroism. But when it comes to death, there is no way around. We must acknowledge that we need a higher power! This is the gift of death (as it is also the gift of our need for sleep, and the command to keep the Sabbath). Like any punishment, it won’t necessarily work; we can ignore this corrective, and still go wrong. But to ponder death is to learn that we need a strength we do not have. More than that, though, the Catholic lives life in light of the Resurrection and Ascension of Jesus and the Assumption and Coronation of Mary. Death is not the last word. Glory is the last word. God affirms life beyond our wildest dreams. Tomorrow we die, but after that, we will eat, drink, and be merry – in some sense – far beyond our wildest hopes. Even these mortal bodies will be filled with the light of the presence of God. To see heaven, though, we have to see that earth is not the end. To see the glory of God, we have to see that human strength is not the way. This is as true spiritually as it is bodily. Spiritually, too – indeed, even more than bodily – we need resurrection, we need the power of God beyond death. To ask for help at the hour of our death is to profess that God’s goodness will be there, far surpassing our weakness. What have you learned from facing death? How do you experience hope in the resurrection and in heaven? We now turn to the second half of the Hail Mary. Here we take a turn, in a number of ways. First, it is a turn from the Bible to the Church’s response. The first half of the Hail Mary is the words of the Angel to Mary, and then the words of Elizabeth to Mary. The second half is how we respond to these Scripture verses. These words were added later, beginning around the year 1500, after the first part of the Hail Mary had been in use for centuries. It is interesting, on the one hand, to imagine devotion to just the first half of the Hail Mary: meditating over and over again on these fine, central words from Scripture: about Jesus (Hail – joy; the Lord is with thee; blessed is Jesus) and about Mary’s relation to Jesus (full of grace; blessed art thou among women; the fruit of thy womb). It is interesting, too, to think about the Church’s response. First the direct descriptions “Holy Mary” and “Mother of God,” and then the personal request, “pray for us sinners, now and at the hour of our death.” The Church does respond to Scripture. In some sense, the Church is a response to Scripture: summarizing what it says, and begging for its fruits. We do this privately, in our personal prayers. But we do it too communally: this kind of common response defines our life together as the Church. The Hail Mary is a prayer we all pray together. But the second half is a request: pray for us. We will consider that phrase directly in a couple weeks. But first notice how this move works. Our requests are made in the context of doctrine. Many of the Church’s prayers work this way: first we say something about God, then we ask him for something in light of that. One aspect of this is rooting our requests in personal relationship. A professor friend just told a story: a student walked into her office, and before she even said hello, she demanded, “where’s the stapler?” No personal relationship. But in our relationship with God, the relationship comes first. We contemplate him, and only in that context do we ask for things. We love the giver more than the gift. Another aspect is rooting our requests in faith. Until we know who God is and what he is about, we don’t know what to ask for. Our petitions look different when we begin by considering the joy of the Gospel, God’s transforming grace, his presence with us, the blessings of his entering into our human life: the themes of the first half of the Hail Mary. Now we have an idea what to pray for. Of course, at first glance it seems odd to do all this in relationship to Mary. Why not just talk directly to God, directly about God, and then directly ask God for things? Why address Mary, and talk about Mary, and ask Mary to pray for us? But in light of what we have said, perhaps the answer becomes apparent. Because God is a God of personal relationship, and personal transformation. We don’t know who God is until we see what he does, what grace means, what his blessings are, how close he comes to us. Mary is not important on her own. She is important precisely because she does not stand on her own. She stands so close to Jesus – and our address to her in the Hail Mary is so completely bound up with Jesus – that she reveals more deeply who this Incarnate God is, and what he has come to do. Finally, consider two ways we can pray the Hail Mary, depending on which part we give primacy to. Or, leaning on the second part, we can just think of the whole thing as begging for help. Not a bad thing to do. What have you learned from the Hail Mary? How do you use it to ask for help? Click here for the entire series on the “Hail Mary”.